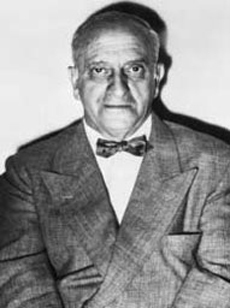 Fifty odd years ago in 1958 Nat Fleischer, founder of Ring magazine, published for the first time his all time divisional boxing ratings. In those ratings Nat rated men in only one division. In 2005 I participated in the IBRO (International Boxing Research Organization) all time poll. In that poll we decided to avoid debates over what division a multi-division champion should be rated by having the voters vote for boxers in each division they were eligible. In my personal ratings however, I have rated boxers only in one division preferring to rate them at their best weight. 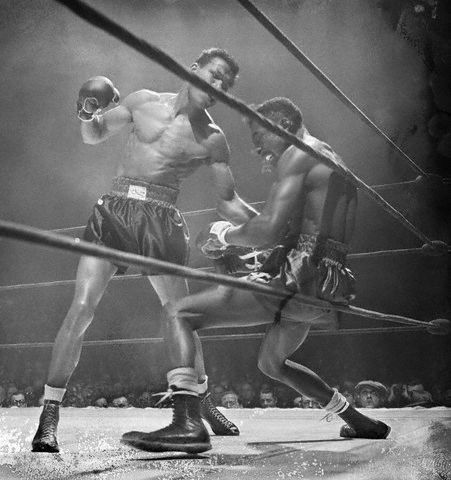 For instance, men like Gene Tunney and Ezzard Charles are considered at light-heavyweight and not at heavyweight, while Bob Fitzsimmons is rated at middleweight and Ray Robinson at welterweight and so on. Since Fleischer first offered his ratings there have been 50 more years of boxing history. In 1958 by my ratings Jack Dempsey would be the # 2 all time heavyweight. But since then there have been some men who deserve to be rated above him. It is most important when rating fighters to be objective. Some will not give credit to modern fighters. Others do not give credit to the greats of the past. So many commentators and fans do not seem to be able to keep from crossing that threshold of objectivity, either over estimating the abilities of the legends and ascribing them abilities that are not present on film or not having the knowledge to understand what some of the greats brought to the ring. Both views are completely wrong. My researched ratings are both fair and balanced. Here is Cox’s Corner’s all time boxing ratings. As one can see my list has changed slightly since my 2005 IBRO ratings. Some historians lists have not changed in 30 years, but a keen open minded observer will constantly reassess his position. Numbers one and two have not changed. The truth is if Joe Louis and Muhammad Ali are not rated in the top two at heavyweight then the list is just wrong. There is no argument. Joe Louis had the most successful defenses and longest reign, and more importantly he was fundamentally flawless, the most complete fighter in division history. See my video The Subtle Skills of Joe Louis. Muhammad Ali faced and defeated the best competition in division history and dominated boxing for most of the 60's and 70's. If Ali and Louis are not in the top two then the list is not credible, I don't care whose list it is. Marciano and Frazier are about equals. 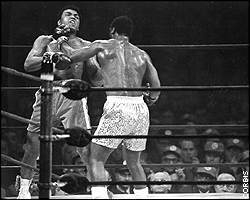 Both were swarming style heavyweights who came in low and attacked the body then ripped to the head. Both were tough fighters. With only one being able to fit in the top 10 what separates them? Is it Rocky's undefeated record but low level of opposition or Frazier's better opposition with losses to only men in the top 3? In the end I believe Frazier achieved a win that Marciano could never hope to duplicate by defeating Muhammad Ali in Superfight 1. Marciano would lose to both Ali and Foreman, the only men to ever beat Frazier and with all other things being equal Frazier did beat Ali in the biggest fight in heavyweight history. Frazier's better overall competition and big win over Ali gives him a spot in the top 10. George Foreman is Cox's Corner's # 3 all time heavyweight. Read George Foreman: King of the Super Heavyweights to find out why. He only won 18 pro fights. There is a lack of good quality film in which to make a realistic assessment of his ability. His punching power is over rated based on his record. The claim that he hit as hard as Foreman or Liston seems nonsensical based on an overall lack of early round knockouts. Jeff wore down his opposition he did not overpower them early. If one is considering all era's and all rules, e.g. 45 round fights to the finish, both 5 and 10 oz gloves, bare knuckles, rules that allowed a lot of holding etc., then Jeffries could be argued into the top 5. However, when assessing boxing as a modern sport the standard should be a 20 foot ring, 8-10 oz gloves, modern rules and a 15 round standard that dominated most of the last 100 years. Holyfield was inconsistent. He beat a comebacking Mike Tyson and a prime Riddick Bowe, but also lost 2 of 3 vs. Bowe as well as lost to Michael Moorer. He was competitive with but lost to Lennox Lewis (in both fights if one were honest), but he also looked less than awesome against 43 year old Larry Holmes and 42 year old George Foreman, one cannot help but believe that prime versions defeat Evander. If one looks at his body of work he was really only outstanding as a heavyweight champion in his victory over a fat, out of shape Buster Douglas from whom he won the title as well as Bowe and Tyson as previously mentioned. In head to head match ups I prefer Rocky Marciano and Joe Frazier over Evander Holyfield amongst the swarmers and would give him a chance to outbox Dempsey, although I would not pick him to do so. In short I have him losing to 8 of 10 fighters in the top 10. This leaves Evander as a borderline ATG who likely rates somewhere between 11-14. All time greats Jack Dempsey and Jack Johnson have dropped a few spots, but remain among the 10 greatest heavyweights in history. Jack Johnson is moving down my list and has faced a serious drop in his rating. Although in terms of sheer talent I think he is right up there with Muhammad Ali, he did not have Ali’s concrete chin and durability and I am also concerned that some of the things he did would not hold up against a more sophisticated attack. The fact that he drew the "color line" against his own race to a great extent also factored into his rating. In his book 50 Years at Ringside Fleischer rated the all time heavyweights in a number of categories. Here is Cox’s Corner’s up to date list. Note: Floyd Mayweather’s career does not give him a top 10 spot. 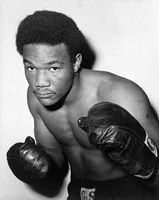 Luis Rodriguez, for example, had a better career than Floyd beating Emile Griffith, Benny Paret, Hurricane Carter, Curtis Cokes, Georgie Benton and Bennie Briscoe. I cannot in all honesty put Mayweather in the top 10 welterweights based on a career of hand picked opponents and having never unified a major title. Floyd avoided fights with Mosley, Margarito and Pacquiao when they meant something. He waited for these opponents to slow down and fade before considering facing them. Mayweather just does not have the competition to be considered a true all time great. I am not convinced that Floyd would beat any of the top 10 all time welterweights. Ray Robinson's ability, record and level of competition puts him at the top. 128-1-2 at his peak that included winning the welterweight and middleweight titles. The argument is who is second best. Joe Gans is the great forgotten fighter, equal in ability to Robinson and better defensively. Although he had a great record he participated in some well known fixed fights and must take a back seat to Robbie in terms of his record and level of opposition. Harry Greb had the greatest record in boxing history, he fought the toughest competition of all time in any era and any weight. Every time one studies his record there is a new gem to behold. He was a whirlwind of motion, attacking from all angles and never gave an opponent a chance to get set. 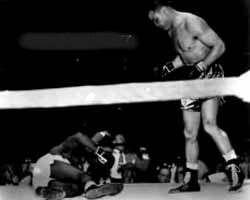 Joe Louis was the best fundamental heavyweight in history and one of the best p4p. The "Brown Bomber" had the greatest lineal title record (25) to go along with his feared hand speed, punching power and laser accuracy. He threw some of the most beautiful short punches ever seen on film and his combination punching was remarkable to behold. Henry Armstrong's feat of holding 3 major weight titles simultaneously puts him in the top 5. An inexhaustable pressure fighter who wore down his opposition with a relentless attack. Muhammad Ali was the fastest heavyweight ever and the most elusive boxer in the ring. He defeated the best competition in heavyweight history. Benny Leonard a genius of boxing strategy. He defeated the best competition to ever appear at one time in the history of the lightweight division. Roberto Duran was the best fighter of my lifetime along with Muhammad Ali and Ray Leonard. He had a peak record of 72-1 and defended the lightweight title 12 times before moving up and winning the welterweight and middleweight titles. He is the only former lightweight champion in history to win a middleweight title. Ray Leonard was as skilled as any boxer of any time. He had speed, movement, classic combinations, good defense, a reliable chin and killer left hook. He defeated outstanding competition in his short career beating Hall of Famer's Wilfred Benitez, Roberto Duran, Thomas Hearns and Marvin Hagler. The final spot was a close race between Ray Leonard, Willie Pep, Bob Fitzsimmons, Jack Dempsey, Jimmy Wilde and Eder Jofre. Ray Leonard could beat you in more ways than could Pep who was a pure boxer or Fitz, Dempsey and Wilde who relied more on their punch. Eder Jofre was as talented but Leonard simply beat better competition.